Out of golf for more than a year, Tiger Woods said Wednesday he hopes to play the first event of the PGA Tour season next month and could play as much as twice more before the end of the year. Woods said if his rehabilitation from back surgeries keeps going well, he would play the Safeway Open in Napa, California, on Oct. 13-16. 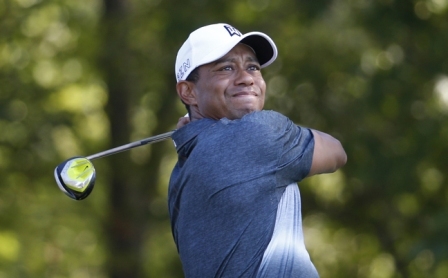 Woods last played on Aug. 23, 2015, at the Wyndham Champion­ship. Two shots out of the lead going into the final round, he closed with a 70 and tied for 10th. A month later, he announced he had another operation on his back. Then, Woods had a third back surgery in October. He missed all four majors for the first time in his career. The Safeway Open is the opening event of the wraparound PGA Tour season held at Silverado. Woods also said he intends to play in the Turkish Airlines Open the first weekend in November and his Hero World Challenge in the Bahamas the first week of December, where he would be eligible for the 18-man field as the tournament host. He also said he would take part in his Tiger Woods Invitational, a charity event for his foundation, Oct. 10-11 on the Monterey Peninsula. “It was difficult missing tournaments that are important to me, but this time I was smart about my recovery and didn't rush it,” Woods said. The announcement was a swift departure from the few public appearances this year in which Woods has said he planned to return but did not have a timetable. Rory McIlroy said he knew Woods was close based on a conversation with Woods’ agent at the British Open this year. He said the PGA Tour sent out an alert to players on their mobile phones, which McIlroy checked at the end of his pro-am round at the BMW Championship. Woods won his 79th PGA Tour title in 2013 at the Bridgestone Invitational, leaving him three short of the record held by Sam Snead. The last of his 14 majors was in the 2008 U.S. Open, right before reconstructive surgery on his left knee. He hasn’t seriously contended in a major since 2013. Woods had his first back surgery right before the 2014 Masters. Woods first played in Turkey in 2013 when it was an exhibition and as part of the deal, he was required to play in Napa at least once over the next three years. Woods had been planning to play last year until back surgery, and then the tournament changed title sponsors. Phil Mickelson also is playing the Safeway Open.